Hello, this is the newest panel on the market. We are the only sellers of this panel and it's affordable for all. This panel have everything you need to start your professional business today in no time! All sales are final and no refunds will be given without real reason such as not working software or not delivered. Do not wait! Start your own business today. Fully manageable panel from administration panel. Simple user interface for best client experience. Support system.Your clients can leave you messages. Set user Instagram image as avatar.The avatar will be taken from the Instagram profile URL which equals to user's name. No page refresh(each submit is handled by the server and the page won't be refreshed). Custom 404 & 500 error pages. 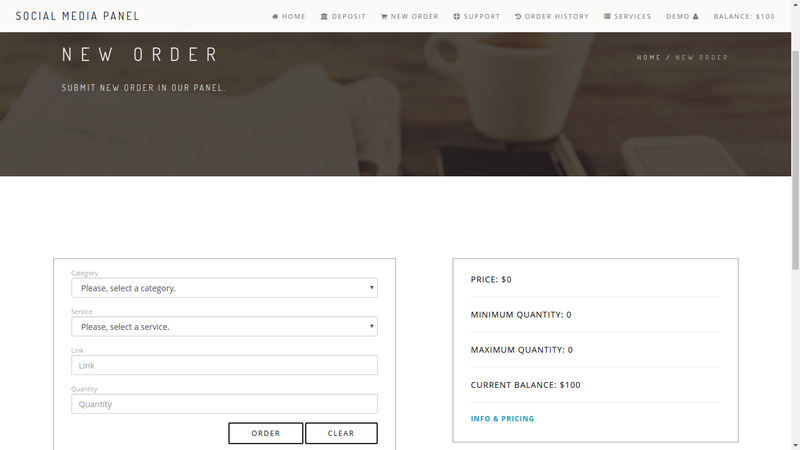 Orders are separated in 3 dropdown navigation bars(all, completed,from API & processing). Lock screen - Same as logout but the username will be kept. You can set minimum & maximum deposit. Whitelist mode - only whitelisted IP addresses can access your panel. Referral system.Custom % per referral purchase. Permanent and temporary user ban with custom reason. Blacklist an IP address to prevent it from browsing your panel. Custom favicon and logo images. Enable and disable registration process fields. Custom footer links(Instagram URL, Facebook page, Pinterest and a lot more..). Individual prices for each user per service. Fully manageable service APIs.Custom API for order and for order status check. Creative and beautiful landing page for your customers. No slow table loading.All table data is loaded with server-side, so data will be loaded when you need it. Generate new user API key.No page refresh. Order information box, live updates which are taken from the quantity, link & service. Box refresh button, no page-refresh. SMM Panel - Crown - Newest on the market - Tons of features is ranked 5 out of 5. Based on 35 user reviews.